A sparse aesthetic vocabulary belies conceptual complexity in the work of Liam Gillick, in which distilled elements of utopian modernism, power ideology, social interaction, and corporate production comprise a constellation of open-ended proposals. His work references function, then departs from it; mines architecture, but prioritizes aesthetic; suggests known structures, only to abstract them; proposes narratives, then fragments, rearranges, and corrupts them. Marking a departure from iconic mid-century modernist architectural forebears (Mies van der Rohe and Le Corbusier) and the Minimalist sculptors who followed shortly thereafter (Donald Judd and Carl Andre), when Gillick works in three dimensions, his objects tend to be industrially fabricated in materials such as steel, aluminum, and Plexiglas and to take the shape of autonomous platforms, shelves, cubes, and architectural interventions on the wall, floor, or ceiling. Emerging from the dynamic arts program at Goldsmiths College, University of London, in the late 1980s, Gillick expanded into social sculpture, cultural critique, and “Relational Aesthetics,” the critic Nicolas Bourriaud’s term for art within a context of relationships. Gillick’s process of creating and producing his objects is an intellectual and participatory one, catalyzing collaboration and engagement with both the commissioning institution and the public. His sculptural works—in combination with his excursions into writing, architecture, design, film, and music—propose a network of phrases, sentences, and paragraphs that critique a set of idealistic objects and ideas implicit in our lived environment. 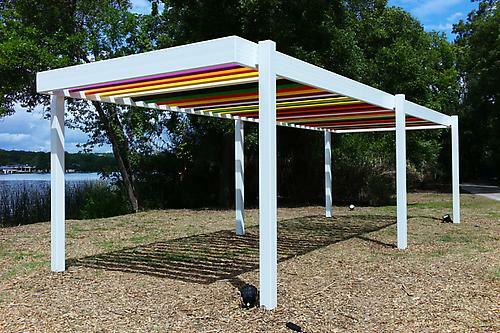 For his exhibition at The Contemporary Austin, Gillick will engage with the rich and complex identity of Laguna Gloria, the museum’s twelve-acre site located five miles from the center of Austin and comprising a historic Italianate villa and twelve acres of lush, semi-wild landscape bordered on three sides by water. Gillick’s exhibition will consist of two elements: a meandering, loosely narrative film taken by the artist on his visits to the grounds, to be exhibited at the Jones Center, and a multicolored, powder-coated steel platform structure, created with the participation of the museum as well as local architects, engineers, and fabricators, to be installed below the villa at the border of the waterfront on Laguna Gloria’s grounds: for the discerning visitor, a surprising industrial insertion into the landscape, and for the wayward wanderer, a simple canopy for human shelter.